The tourism brochures don’t crow about it, but this island is overrun by chickens. 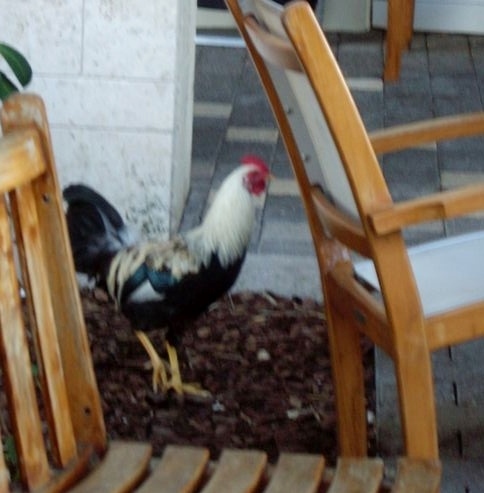 Chickens in Georgetown, chickens in Bodden Town, chickens clucking around tables in uptown outdoor restaurants. Chickens on the roads and chickens in the trees. Chickens in Hell (I’ll get to that in my next post). You can hardly turn around without a chicken in view. This morning I took a bag of trash to the dumpster. On the way, Simon said “Be careful – there’s a rooster living in the dumpster and he gets annoyed when you throw garbage on his head.” Oh ha, ha, I thought – a rooster in the dumpster – sure, sure. So I chuckled all the way over there. As I lifted the bag to toss it in, a large and energetic-looking rooster emerged from the depths of the bin and gave me a filthy stare. He leapt onto the top of the trash with a grumbling “BAWK!” and for a moment I thought I was going to do morning battle with this feathery protector of all that has been tossed. And I knew who would win … not me. Best of luck, he did a good impression of a roadrunner, dashing across the trash and away into the bushes. 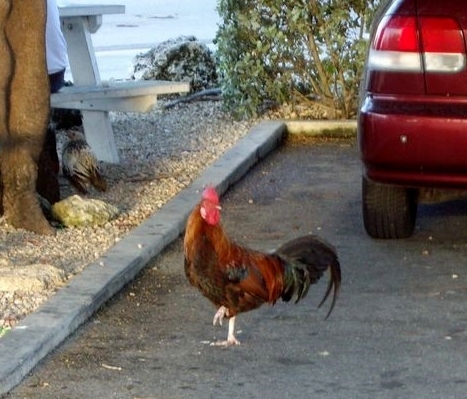 Chickens in the parking lots – all of them. 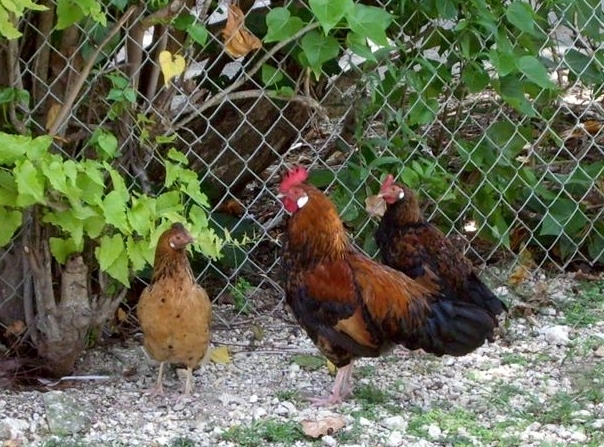 We saw a lot of stray chickens in Hawaii, too, but I think for sheer numbers per square mile, Cayman would win, hands down. Or beaks down. The roosters here also have no sense of time. They crow most of the night. So if there were to be a midnight crowing contest, these birds would be champions. This guy was on the move through a very uptown outdoor café.